This is an active case and only information that has been publicly reported is available at this time. Brick’s case has received national media attention because his owner cut off his ears and shared it on social media. Valiant helped locate the offender and processed the physical evidence that was removed from the crime scene and conducted the forensic analysis. Brick was kept by Valiant in protective custody during this case. We also supplied emergency medical attention for Brick and long-term care as he recuperated. 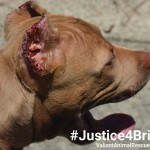 Brick’s offender recently plead guilty to animal cruelty charges. Although the offender originally claimed that he was innocent, our forensic testing uncovered traces of blood and fingerprints on various items including a pair of kitchen scissors that was used to cut Brick’s ears and a prescription bottle of sedatives. Bruce Tyler was charged with a felony and received 366 days in jail on top of the jail time already served, 4 year’s probation, 40 hours community service, and is not allowed to own or live with an animal. Part of the plea agreement was that ownership of Brick had to be signed over to Valiant Animal Rescue & Relief. We are very appreciative of the collaborative work that was done in partnership with law enforcement and county agencies, including Georgetown County Sheriff’s Department, Williamsburg County Sheriff’s Department and Williamsburg County Environmental Services, whose countless hours on this case and collaboration with us made this conviction possible. Brick is doing well now and is no longer head shy. His ear infections and urinary tract infection have cleared up, the fishing line was removed and his ears are healed. We are now exposing Brick to lots of activities and will be working with a trainer to continue his long term plan.